The OSFACO project (Satellite remote sensing of forests in Western and Central Africa) started in April 2016 for 3 years, and aims to improve the knowledge of past and current dynamics of land use / land cover in 8 countries in Western and Central Africa (Guinea, Ivory Coast, Benin, Cameroon, Central African Republic, Congo, DRC and Gabon), thanks to space observation tools. OSFACO is coordinated by a consortium led by IGN FI and made of IGN (French National Institute of Geographic and Forestry Information), CNES (French National Centre for Space Studies), and IRD (French Research Institute for Development). Capacity building and resources strengthening for spatial land monitoring, and promoting the use of satellite imagery in the design and monitoring of public policies; Scientific animation; call for projects. In order to benefit from regular feedback from the beneficiary countries, a Regional Monitoring Committee has been set up. Gathering the 8 technical focal points of the countries involved, this committee is meeting up once a year within one of the 8 project countries. The aim of such a committee is to improve communication on our project and strengthen the leverage effect on public policy, fostering exchanges between users and decision makers. 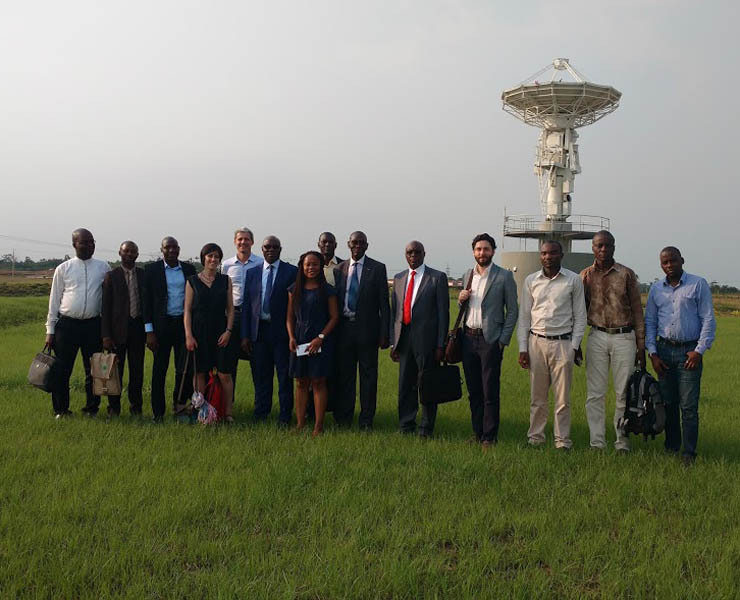 The first meeting of this Monitoring Committee took place on Tuesday, February 7th, 2017 at the premises of AGEOS (Gabonese Agency of Space studies and Observations), alongside the 3rd Geomatics Days organised in Libreville. This day has been very rich in discussion and debate, in particular regarding all aspects linked with the free distribution of SPOT images: which projects are eligible? How to increase the number of users? How to improve the distribution process already in place in some countries? How to overcome technical constraints (in particular internet access problems) to distribute the data? The “old” countries (Congo Basin countries already involved in the previous project OSFT) were able to share their experience with the “new” Western Africa countries. The positive results of this day have demonstrated the benefits and relevance for OSFACO project of such a committee, gathering the representatives from the 8 beneficiary countries.